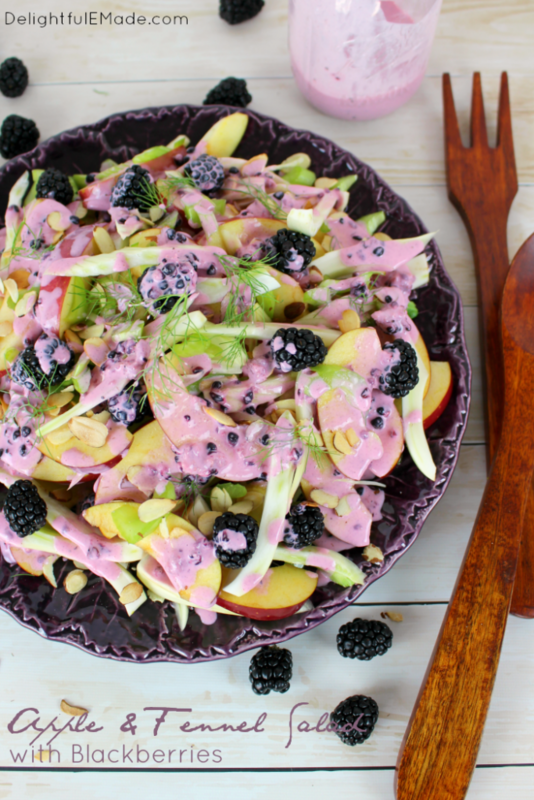 Fresh, crisp apples and fennel are paired with blackberries, celery and toasted almonds to make this delicious salad. 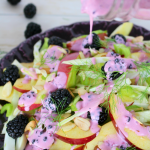 Topped with a creamy blackberry vinaigrette, this delicious side dish comes together in just minutes! 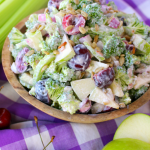 Perfect paired with chicken or salmon and also makes a wonderful holiday side! Up until a few weeks ago, I had never tried fennel. It was always something rather mysterious that I saw in the supermarket, but never actually put in my cart and purchased. 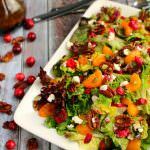 This all changed when I recently tried a fresh, crispy salad at my local Wegmans supermarket, and it included fennel! I had no idea that you could eat fennel raw, let alone have it bring the amazing flavor that it did to the salad. 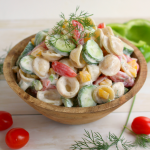 From here, I decided that I needed to create a salad of my own and include this new found favorite veggie! 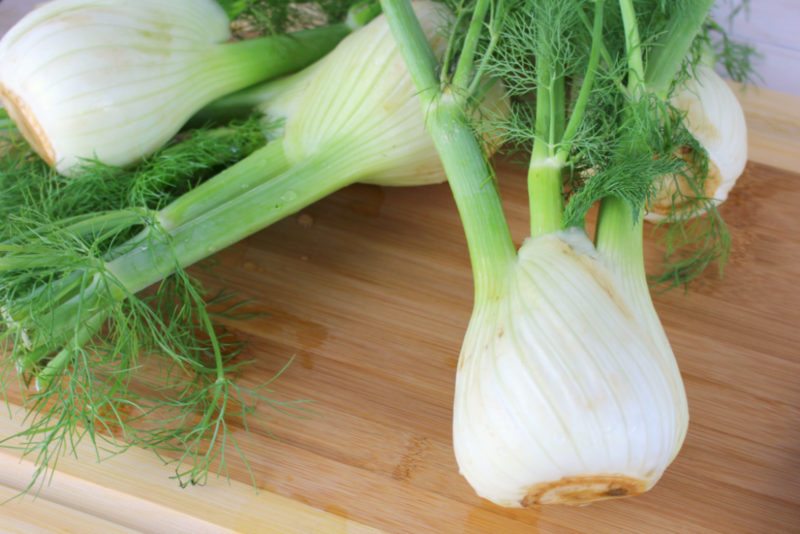 If you’re like me and have never had fennel, it is a very crisp vegetable that looks a little like an onion. 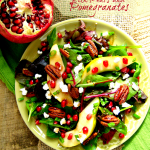 It has a slight anise flavor, but when added to other fruits or vegetables or roasted with meats, it becomes even more flavorful and complimentary. 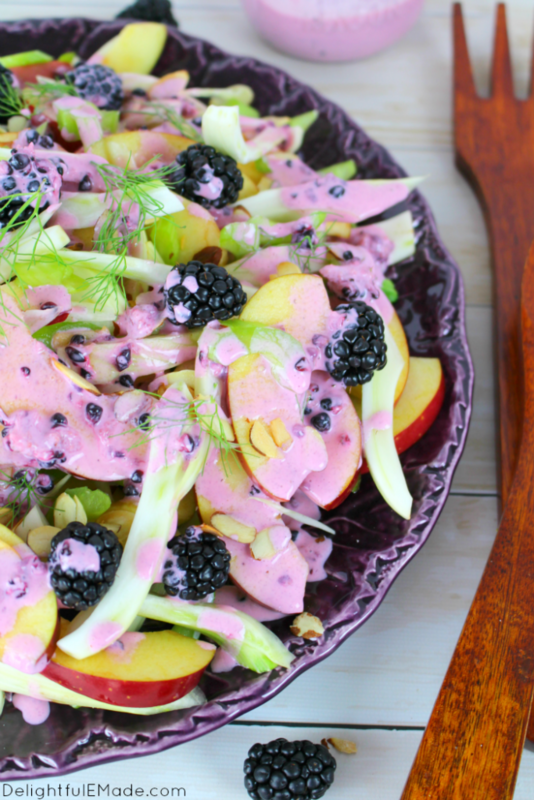 To make my salad, I paired the fennel with sweet, red delicious apples, along with celery and blackberries. I topped with salad with some toasted sliced almonds and made a simple blackberry vinaigrette. 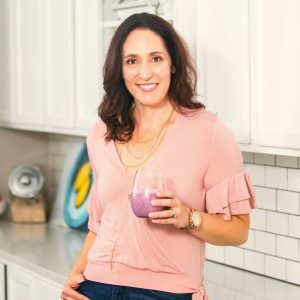 This vinaigrette comes together by simply mashing blackberries, and adding sour cream, vinegar, sugar, salt and pepper. I love making my own dressings, and actually prefer homemade over store-bought. 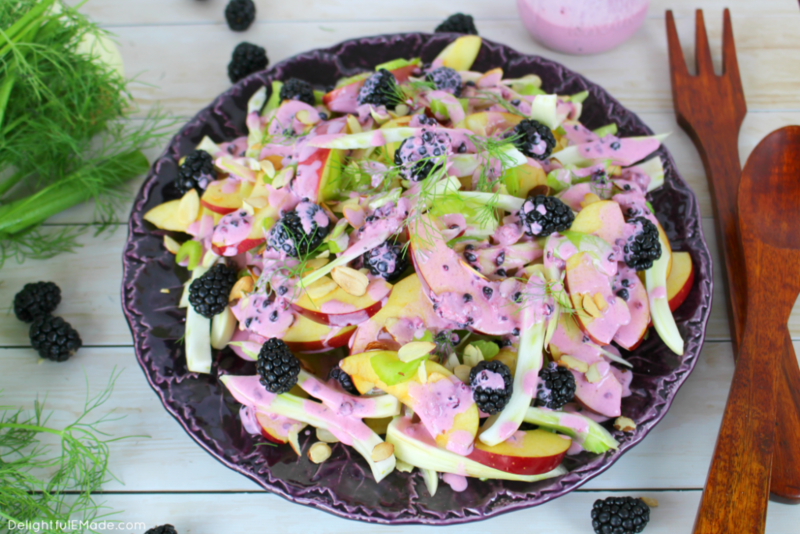 You can combine the ingredients you’re already using, (in this case, blackberries) and create a wonderfully complementary way to dress your salad. 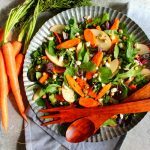 If you wanted to make this salad into a complete meal, it would be fantastic with grilled chicken, salmon or even shrimp. With these ingredients available almost all year, its something that can be made in just about any season. 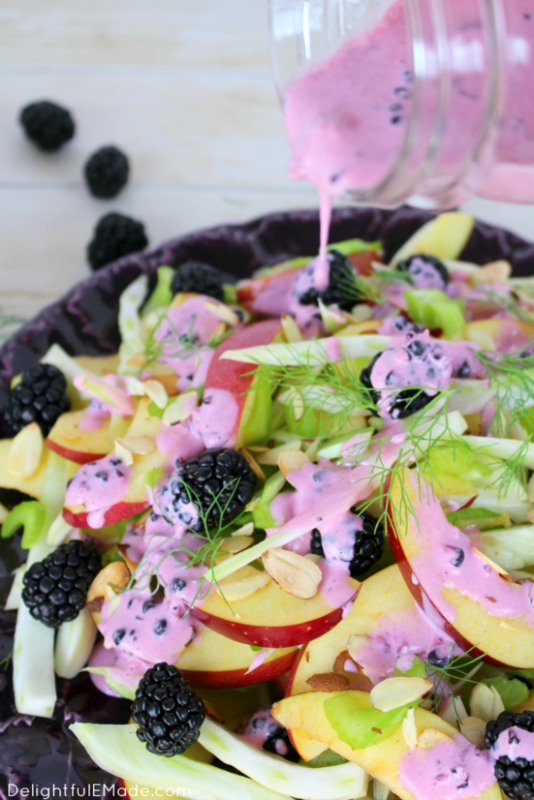 In a large bowl, add the sliced apples, sliced fennel, celery and blackberries, reserving about 8-10 blackberries for the dressing. Toss together to combine. In a small bowl, mash the reserved blackberries, and add the sour cream, vinegar, sugar, salt and pepper. Mix together well with a fork. Just before serving, pour the dressing over the salad, and toss lightly. Top with the toasted almonds and serve right away. If making the salad in advance, cover and refrigerate until ready to serve, separate of the dressing. Do not dress the salad until just before serving. Love how different this is! I need to try this asap! Not something I would think of, but it looks really good! Thank you for linking up to the Tasty Tuesday linky. I have pinned your recipe to the Tasty Tuesday Pinterest board. I hope you'll join us again this week. 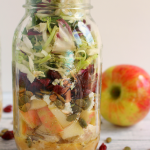 This is a beautiful Salad... Loving the Apple and Fennel combo but that dressing looks even better! Pinned! Thank you for sharing this with us at #SaucySaturdays! Pinned & shared.Thanks for joining the Inspiration Spotlight party! Hope to see you again soon.